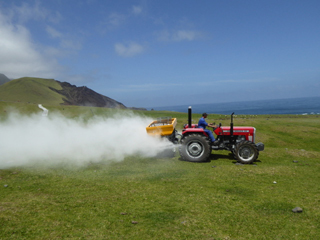 Grazing animals (cattle and sheep) are the most important farming enterprises on the island, which means that grass production is exceptionally important. Unfortunately, the Plain is boulder strewn and the soil is thin and very acid. The Department of Agriculture is tasked with improving the growing conditions as much as possible, primarily by the application of agricultural ground limestone to reduce soil acidity, and the application of nitrogen fertiliser after each grazing cycle. The Department also looks after the stock fences and the cattle grids. Right: Spreading lime raises the soil's pH to help grass growth. 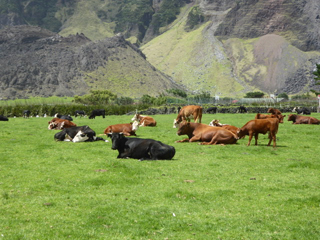 Cattle are individually owned, and one of the tasks of the Department is to police the ownership of cattle according to a quota which is established by the Island Council. Currently the quota is one adult breeding cow per household. The Department also has to check that the youngstock are properly recorded, and to see that they are recorded in their proper categories. As in most farming situations around the world plastic ear-tags are used to fix a number ID for each animal. The island cattle are made up of a mixture of breeds. Improvement has recently been made firstly by the use of artificial insemination (AI) to introduce Aberdeen Angus, Welsh Black and Redpoll breeds, with young bulls selected from the Welsh Black and Redpoll crossings, and secondly by the importation of two young Aberdeen Angus bulls from South Africa. There are some cattle kept at The Caves and at Stony Beach, which are semi-wild and are extra to the quota system. There are also a limited number kept at Sandy Point, with numbers controlled by the Department. Left: Imported bulls grazing with island cattle. There is a whole mixture of sheep breeds on Tristan, with the sheep being kept for meat as well as for wool. The Department gathers the sheep several times a year for medical treatment (fly and worm treatment) and for shearing. 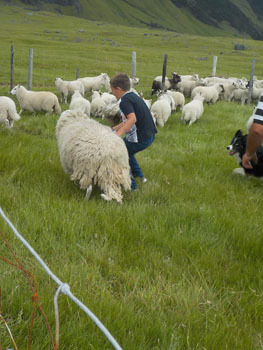 Shearing Day, generally in December or January, is one of the important days in the annual calendar. With the help of some of the children the sheep are brought into individual owners' pens, where they are clipped using old-style hand shears. There is a significant cottage industry on the island for the production of woollen goods, with all the stages of carding, spinning and knitting being done by hand. Mutton is on the Tristan menu throughout the year, particularly thanks to the fact that all households have a deep-freeze, and the traditional Christmas dinner on the island is stuffed roast mutton. An unknown number of sheep roam unattended on the mountain, where they can sometimes be harvested for meat. Read more on our 37 Degrees South Knitwear page. Sheep being penned for shearing. 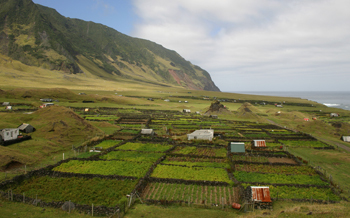 Tristan da Cunha is well-known for its production of potatoes, which in turn form an important part of the staple diet of the people. Most years people on the island send potatoes to their friends and relatives on the island of St Helena, and surplus potatoes are used for cattle feed. Most of the potatoes are grown at the Patches (shown left), in small plots that are surrounded by walls to protect the crop from the wind, although sometimes garden plots within the Settlement are used for potatoes, and sometimes plots at the Patches are used for vegetable crops. Commercial potato growers around the world would be surprised to know that potatoes are grown at the Patches year after year on the same plot, with no rotation – for some reason the particular conditions on Tristan enable this to be done without massive pest and disease build-up. Increasing importance is being placed on the growing of fruit and vegetables. Not only is the principle of self sufficiency important, but also for such a remote island the strategic importance of growing produce locally is becoming increasingly clear as a result of problems with imported supplies. Tree fruit includes apples, pears, peaches and nectarines, and strawberries have recently been tried with a degree of success. 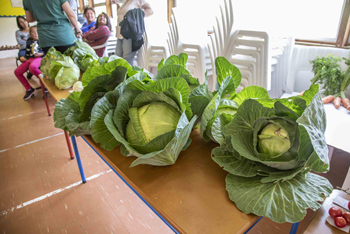 The Department of Agriculture operates two small greenhouses, capable of producing salad crops around the year, and many islanders produce vegetables in small gardens near their houses which are surrounded by New Zealand Flax for wind protection. The Settlement is surrounded by coops for chickens and ducks, which keep a supply of eggs coming to the households, and are very useful for recycling kitchen waste. 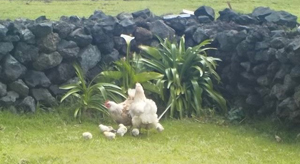 At present (2019) there are around 700 chickens and ducks. In the past, geese were also kept, but there are none on the island today. Within the Department of Agriculture is the sub-division of Veterinary Services. This is responsible for carrying out routine treatment to the cattle and sheep and to help with lambing and calving, as well as to carry out flea and worm control on the many dogs. The Veterinary sub-division is also responsible for looking after animal import regulation and documentation. In the last four years the island has hosted no fewer than three visiting vets, although it is generally acknowledged that there are too few animals on Tristan to be able to properly justify a full-time qualified veterinary presence.